and connect your Social Networks. Create a Download Page by uploading a file, or a URL Gate by pasting a URL. Every time someone accesses your Download or URL, you'll get followed on Click.DJ & all your social networks. Our unique Patent Pending Follower Synchronization Technology will get you followed on ALL social networks with a single click. When someone downloads your file or accesses your URL, they'll follow you on Click.DJ and their social networks. When someone connects to a new network in the future, they'll also follow you on that network. Fans, artists, labels, blogs, channels, managers. Require users to follow you on your social networks in order to download your content or access a URL. Get followed on all social networks with a single click. See where your followers are located, along with all their social media links. See what's happening with your content in real-time on your activity feed. Offer free downloads to your music in exchange for getting followed on all of your social networks. 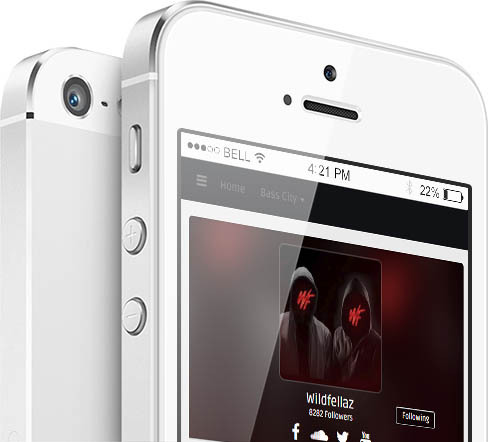 Get followed on Click.DJ, SoundCloud, Facebook, Twitter, YouTube, Instagram, Spotify, and Email with a single click. Shorten URLs and create 'URL Gates' that work just like Download Pages. Get followed every time someone goes to a shortened URL. 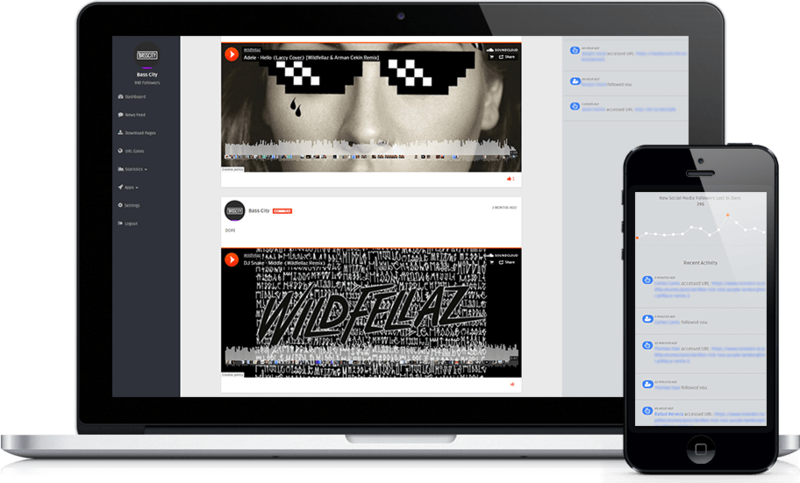 If you create a Download Page, users can automatically Share your song on SoundCloud or YouTube when they start their download. Require users to leave a comment on your download page. If the page has a YouTube video or SoundCloud track, the comment will be posted there too. 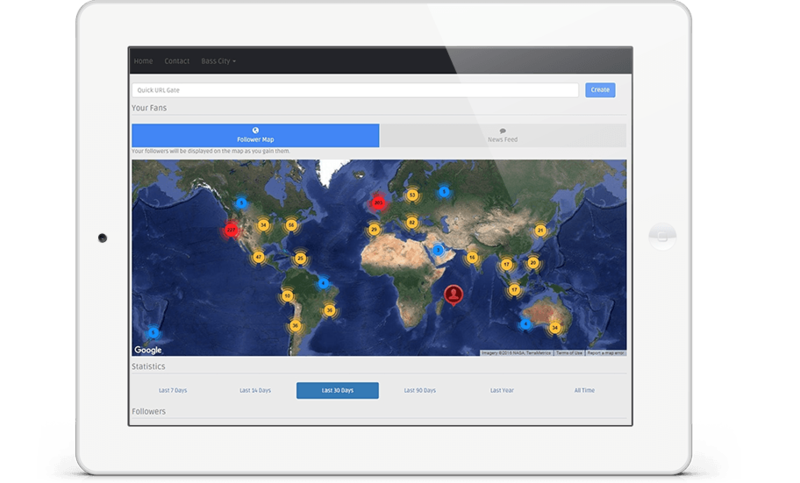 See who's interacting with your content in real-time. All interactions are displayed on your activity feed in real-time. 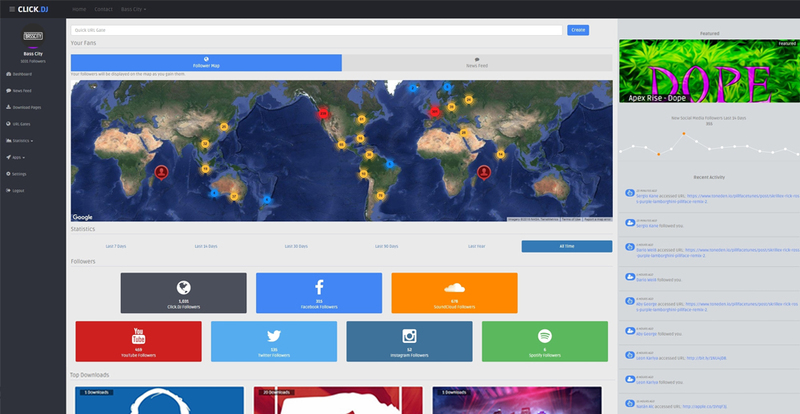 See exactly where your followers are located on a world map displaying your followers' profiles. Every time a Click.DJ follower downloads any song or accesses any URL, they'll connect to a new social network. You'll also be followed on that social network. Patent pending. 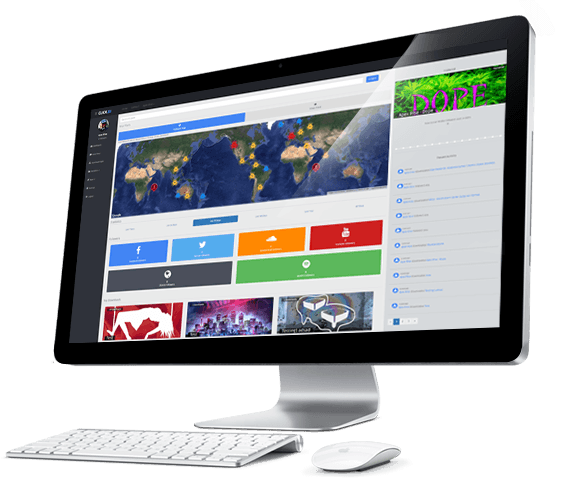 Get started with Click.DJ for free! Subscribe to one of our plans for unlimited use of our products. © 2016. Click.DJ. All rights reserved.